In the end of that blog, I asked radiation exposure expert to analyze advice given on STUK’s website. The analysis has shown that the information provided by STUK is inaccurate and in some cases simply false. I asked an expert from the Cellraid, Ltd, a new start-up company developing applications for monitoring exposures to radiation emitted by wireless communication, to review STUK statements on its website [available in June 2014]. 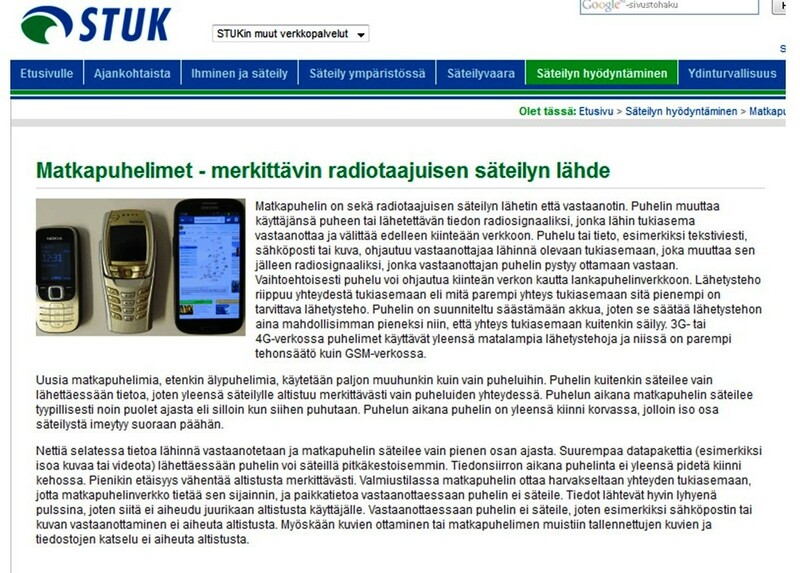 Cellraid’s expert reviewed the last two paragraphs of text, beginning with the words “Uusia matkapuhelimia, etenkin älypuhelimia…”, [translations in brackets by DL]. Cellraid – This is not true. Currently, exposures from data transfers exceed exposures from phone calls. Cellraid – This is partially true. I do not know where they have come up with the 50%. It is true that modern systems utilize DTX (only transmit when there is voice activity) but 50% sounds very low. I would consider that it is much higher… most likely closer to 100% than to 50%. Cellraid – This is partially true. Under typical web browsing situation phone retrieves website and then majority of time is spent on reading trough the website. However, more and more of the web usage is video usage or looking at image rich websites, and this is clearly causing exposures from phone. Cellraid – This is not true. There is significant data usage while cell phone is seemingly in idle. While cell phone is not used it still updates email, Facebook, twitter, phone software, etc. During this activity phone is typically in the pocket. So this statement is simply false. Furthermore, when people are using tablets, they are typically leaning to the body. So, it could be argued that the most of the tablet usage is causing direct exposure to the body. Cellraid – This is not true. This was true before the era of smart phones. Now this is not anymore true as smart phones are constantly using data traffic for email and social media applications. Smart phones are not idle when in the pocket. Cellraid – It is true. When the cell phone is checking/downloading email, it is not a constant activity (like voice call), but it is activity that lasts several seconds or even tens of seconds each time. Cellraid – This is partially true. If a cell phone simply received information it would not radiate. However, there is no such thing as just receiving. When the phone is receiving data, it is also acknowledging all the data packets to network. So, even when it is receiving it is still transmitting at the same time…, and it is radiating during that time. Cellraid – This is partially true… assuming that phone is configured so that when taking pictures no meta-data (location) is saved. By default, most phones are configured to save location. In this case, there is a small burst of data sent even when taking picture. Following publication of this information on BRHP, and seeing from the internet traffic that the blog was red at STUK, I expected that inaccurate or false information will be corrected. This inaction of STUK “experts” demonstrated complete scientific arrogance and ignorance because STUK continued to present false information on its website. I just looked, again, at the website of STUK and noticed that STUK “dosimetry experts” continue to provide the same, erroneous, information about smartphone radiation exposures. Is this a lack of expertise or is it something more sinister? Why STUK does not openly inform that smartphones cause much higher radiation exposures than the old phones? Why STUK does not inform that using skype, to make cheap calls on smartphone, leads to SAR exposure levels that are higher than those permitted by the current safety standards? WHY? Please, kindly respond ASAP or provide deadline by which response will be available. STUK valvoo puhelinten vaatimustenmukaisuutta ja seuraa käyttötottumusten muutoksia aktiivisesti. Www-sivuilla ja muissa viestintämateriaaleissa julkaistavia suosituksia ja ohjeita altistumisen vähentämiseen päivitetään jatkuvasti tarpeen mukaan. Muun muassa blogissa esiin nostamiasi sivuja on käyty sittemmin läpi ja vanhentunutta tietoa päivitetty. Vaatimustenmukaisuuden osalta samat säännöt koskevat sekä älypuhelimia että perinteisiä malleja, joten data-yhteyden aikanakaan altistuminen ei saa ylittää rajoja. Vaatimustenmukaisuudesta vastaa ensisijaisesti aina puhelimen valmistaja. STUK on suorittanut alueella aktiivista markkinavalvontaa jo yli kymmenen vuotta. Vaatimusten vastaisia puhelimia ei ole jäänyt kiinni valvonnassamme. SAR-arvon määrittämisessä käytettävä mittausmenetelmä perustuu harmonisoituihin standardeihin, joiden vaatimukset STUKin laitteisto täyttää. STUK osallistuu myös näiden standardien ylläpitoon. Älypuhelin eroaa perinteisistä malleista siinä, että se saattaa käyttää monia sovelluksia jatkuvasti. Tämä ei automaattisesti kuitenkaan tarkoita merkittävää altistumisen lisääntymistä. Useimpien sovellusten tiedonsiirto painottuu vastaanottoon ja lisäksi näitä käytettäessä puhelin on kädessä. Käytössä on myös sovelluksia, jotka lähettävät suurempia tietomääriä puhelimesta verkkoon. Tällaisia käytettäessä altistumista voidaan vähentää helposti pitämällä puhelin kauempana kehosta, esimerkiksi pöydällä tai laukussa. This is an absolutely untruthful statement from Mr. Petteri Tiippana, Director General of STUK. There was no revision or updating of information that was criticized as inaccurate or false in BRHP blog of June 18, 2004. 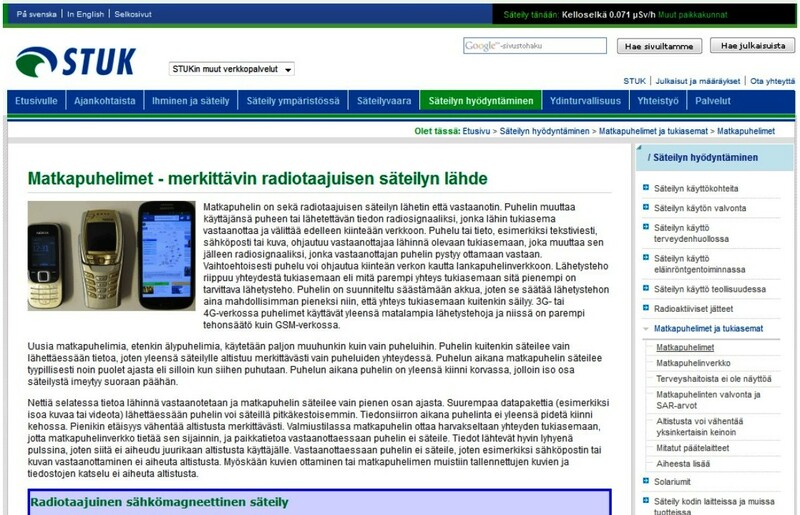 The only update made to the web page was an addition of information providing technical information about different cell phone technologies: “Matkapuhelintekniikat: GSM, UMTS (3G), LTE (4G) sekä GPRS ja EDGE”. The information about human body exposures from smart phones remained completely unchanged. Clearly, there is some leadership and expert problem at Finland’s STUK – Radiation and Nuclear Safety Authority. The lack of any change to the information on smart phone exposures you can see for yourself in screenshots below. If you do not know Finnish language, you do not need to translate text – just follow pattern of distribution of the words – no change in it at all. Today, on April 20, 2015, the information on STUK’s website remains unchanged. This entry was posted in Mobile phones and health and tagged Director General of STUK, Non-Ionizing Radiation Laboratory of STUK, Petteri Tiippana, scientific arrogance, scientific incompetence, smart phone, STUK, Tommi Toivonen, true, untrue by dariuszleszczynski. Bookmark the permalink.